Winter riding in the Foothills – What do your horse neighbors do? 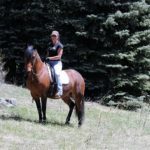 Being a horse owner in the Colorado Foothills offers different dynamics to riding in the different seasons. We have a plethora of amazing trails within an hour of our door. Our spring, summer and fall weather offers many days of beautiful outdoor riding weather, with few days lost to precipitation. But living in an arid climate, we take what moisture we can get! The Rocky Mountains are just that, rocky – the ground is hard and abrasive on horse hooves. There are very few horses that can take all of our trails barefoot. The majority of riders have their horses shod for the main riding months, at least in front or use some kind of trail boots when riding in hard or rocky terrain. This year, fall and early winter have allowed for some beautiful cool weather riding, but we all know the snow will soon fall and the mountains and valleys will fill their stores of moisture for the coming year. Indoor arenas are more the exception in our community, but are a great way to carry on with riding and training no matter the weather. Some people choose to board their horses at a nearby indoor facility during the winter or even head south for a month or so to facilities such as in Arizona that offer Roping, Team Penning and Ranch Sorting during the winter months. Some head to California or Florida in the early spring to start getting geared up for the summer show season. No matter the discipline, the local events slow down significantly or come to a winter hiatus. What do we do to keep our horses active and fit? Here are some winter activity ideas from your local horse neighbors on what they do in the winter months when the trails get icy and the outdoor arenas are hard and crusty. Activities – Trail riding in neighborhood, local fields and fox hunting, but only when the footing is good. I am a safety freak! I have had my horse and I slip and fall and I want to avoid this again! Arena – Outdoor freezes, sometimes trailer to Jeffco Fairgrounds Indoor Arena. I have heard there is a brand of magnesium chloride that is environmentally safe you can mix with outdoor arena sand to keep it thawed out. Turnout – Always, no matter the weather. Time off – Not by choice, but just inevitable sometimes. Winter boarding – Thought about it, but turnout is limited and I won’t give up giving them my special attention and care. Feet – Borium and snow pads – tried pulling shoes in the winter, but mine come up lame. Tried Easy boots – but just simpler to shoe. Activities – We ride around our property all the time unless it’s terribly icy and love riding in the snow. When our outdoor arena becomes snowy – I pull a sled behind my horse! This winter I am planning on pulling skiers behind me for some skijoring. Otherwise I haul down to Chatfield Park and other parks as long as it’s not icy. Arena – We have an indoor arena and a heated barn so that makes the coldest of months bearable. Still many of my clients don’t ride much during the holiday season in December if it’s too cold. I encourage everyone to at least lunge their horses and give them a mash after workout to keep them hydrated and help prevent impaction colic. If we don’t get too much snow our outdoor arena stays alright. Feet – Barefoot horses stay barefoot in winter. For horses that I shoe, I add snow pads. I truly believe horses here in Colorado need some sort of hoof protection while being ridden – hoof boots or shoes. The ground is just not forgiving and very abrasive – even in winter – riding that much more on the sandy surface of the indoor, still files their toes plus they don’t grow much horn in winter. Activities – Love loping in deep fresh snow in the pasture, or for slick days, ground and liberty work! Activities – I seem to do more training in the winter because the icy trails (especially in the shade) aren’t safe. Favorite Activity – One year a friend and I trailered down to Chatfield Park. We bundled up as it was about 20 degrees F. There was snow on the ground, but we just walked and stayed on the dirt service roads. It was sunny and beautiful and one of my favorite rides ever. The horses really seemed to enjoy it too. Arena – My outdoor arena stays pretty good until January, but then gets too frozen and hard. Then I go down to Jeffco indoor arena 1-3 times a week. It costs $5 and is usually open Monday thru Thursday, but you do need to call to make sure it hasn’t been rented. 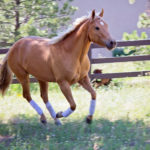 Feet – My horses wear rubber boots when I trail ride so I feel a little better about riding the hard roads, but do tend to spend more time in arenas. Activities – I still try to ride at least 5 times a week—and continue with lessons– regardless of the wind or the cold. Only if it is below 25 degrees do I not ride or ride a much more easy routine for the sake of our horses. Arena – I board at Red Hawk Ranch in Conifer which has both an outdoor and a lighted indoor arena (although unheated) my riding changes very little with the seasons. Our outdoor gets good sun and is generally clear but when not, we use the indoor. Feet – We pull shoes in the winter since we are generally only riding in the arena so generally do not trail ride. We typically do not do shows in the winter. Activities – I love riding in the snow, and my horses love it as well. Of course I work on big turns, or collection (I used to get wonderful passage on my dressage horse in the deep snow!) and transitions, we go on trail rides, either up here or down the hill, depending on the footing. Arena – I try and get in some work in an indoor just to keep the training from falling too far backwards! Activities – Fox hunting and trail riding. Fox hunting is a winter sport because originally hunts ran over farmer’s fields, which are fallow only in the late fall and winter. If I have two operational horses, I will hunt twice a week during the October through April season. Although the Arapahoe Hunt is very fast, it is also quite relaxed about riders who want to go at a more sedate pace on any kind of sensible horse. If you want to ride right up with the hounds, you need a fast, well conditioned horse, normally a calm thoroughbred or cross (yes, hard to find). I do ride in the “first flight”, so I have to start conditioning on the local trails in August, and then exercise once or twice a week during the season. Fortunately, there are some good people who enjoy helping me out with the exercise program. Hunt season also means lots of grooming, tack cleaning, trailering and all the special care that goes into keeping a horse in top condition for seven months. Fox hunting is the only horse sport that is non-competitive where you get the thrill of a five mile gallop across the Colorado high plains. Check out the Arapahoe Hunt website at http://arapahoehunt.com/ or call Dan at 303-674-3834 for more information. Feet – Shoes with borium. 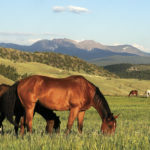 Activities – Riding in fields, fox hunting, riding in outdoor as weather allows, trailering to Jeffco Fairgrounds when the other activities are not possible. Spring Gulch Equestrian Area in Highlands Ranch can be a great place to trailer to in the winter. Turnout – always with shelter options. Time off – I like my horses to get breaks and that happens naturally in the winter months when I cannot ride as often. Winter boarding – Have tried and may again depending on goals, but I miss my horses and caring for them! Arena – If ground is good and it is above ~25 degrees F, yes! If too cold, don’t want my horse to get too wet and chilled. I only have run in barns. Feet – Depending on job, two are barefoot for winter and have trail boots if needed, one has shoes with snow pads and holes for studs. Clip – The fit horse that gets ridden the most is partially clipped and blanketed as appropriate. Others in light work, au natural. Spring Gulch Equestrian Area, Chatfield State Park, Bear Creek Lake Park.